Imagine that we had some way to look directly at the molecules in a living organism. An x-ray microscope would do the trick, or since we're dreaming, perhaps an Asimov-style nanosubmarine (unfortunately, neither is currently feasible). Think of the wonders we could witness firsthand: antibodies atta- ing a virus, electrical signals racing down nerve fibers, proteins building new strands of DNA. Many of the questions puzzling the current cadre of sci- tists would be answered at a glance. But the nanoscale world of molecules is separated from our everyday world of experience by a daunting million-fold difference in size, so the world of molecules is completely invisible. I created the illustrations in this book to help bridge this gulf and allow us to see the molecular structure of cells, if not directly, then in an artistic rendition. I have included two types of illustrations with this goal in mind: watercolor paintings which magnify a small portion of a living cell by one million times, showing the arrangement of molecules inside, and comput- generated pictures, which show the atomic details of individual molecules. 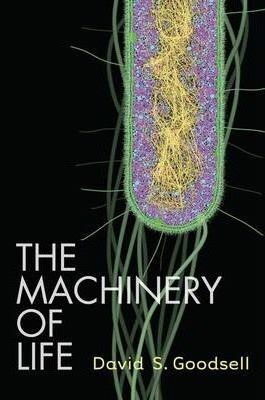 In this second edition of The Machinery of Life, these illustrations are presented in full color, and they incorporate many of the exciting scientific advances of the 15 years since the first edition. Illustrations note XII, 167 p.
Introduction.- Part I: Molecules and Life: Molecular Machines.- The Processes of Living.- Part II: Molecules into Cells: Escherichia coli: One of the Simplest Cells.- Baker's Yeast: The Advantages of Compartmentation.- Human Beings: The Advantages of Specialization.- Plants: Gathering Energy from the Sun.- Part III: Cells in Health and Disease: Life and Death.- Vitamins.- Viruses: Biological Hijackers.- Poisons and Drugs. Dr. David S. Goodsell is Associate Professor in the Department of Molecular Biology at The Scripps Research Institute, La Jolla, CA, USA. His illustrations have become well known and now appear in many publications as the primary demonstration of the crowded nature of cells. He has also provided expertise and illustrations to many science museums, most recently acting as a "thinking partner" for a new multi-site nanotechnology initiative headed in part by the Exploratorium in San Francisco.